Much of the production experience with light-oil-air injection in the United States has occurred in the southwest portion of the Williston Basin near the Cedar Creek Anticline. The following figure identifies several fields where air injection has been ongoing or recently started. Production from several of these fields is summarized here. Air injection began in the Buffalo Units in Hardin County South Dakota in the late 70’s after water injection was unsuccessful. It then was successful at the Medicine Pole Hills Units (MPHU) and recently at the Cedar Hills North Unit. EUR for these fields tends to be three to four times primary production. Now, air injection has begun at the Little Beaver and Pennel Units of the Cedar Creek Anticline and the remainder of the anticline. The first fields where air injection was applied were the Buffalo fields. Primary production began at the Buffalo Red River unit in 1954. Infill drilling was complete by 1960 and an air injection pilot began in 1979. Production doubled within two years, so the air injection rate was increased to 10 MMcf./day for this 10-foot-thick carbonate. After 25 years of full-field air injection, production is still above the highest primary production and will continue for many years. Air injection began at the South Buffalo Red River unit in 1984 and at the West Buffalo unit in 1988. The decline rate in these reservoirs is also very slow. Altogether, there are 160 wells at 80-acre spacing in the Buffalo Red River Units. After up to 25 years of air injection, oxygen has only broken through at two wells. By 2002 Continental Resources had enough experience with air injection to design a full-field project for the Cedar Hills unit and invest over $100 million using simulation as their guide and without a pilot. Approximately 100, one-mile long, horizontal wells were drilled in order to obtain the production response shown in the following figure. 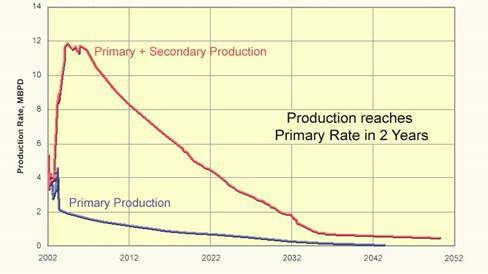 Actual production tracks this prediction and reached 12,000 bpd. Encore Acquisitions purchased the Cedar Creek Anticline from Shell after isothermal equation-of-state simulations and laboratory combustion tests showed that air injection would also be profitable there. They plan to implement air injection in most reservoirs along the anticline. A pilot has been conducted in the Little Beaver Unit. Encore expects to book 15 million barrels of LOAI reserves from the Little Beaver unit (following Shell’s 20-year waterflood). Their capital expenses are expected to be $2.10/barrel and operating expenses at peak production under $7/barrel. This is expected to generate a rate of return of 22% for $25.00 oil. Obviously, the project is somewhat more profitable now. Production at the Pennel Unit will increase to 13,000 bpd due to air injection. This is 5,000 bpd above the anticipated peak production from infill drilling and workovers. The capital cost for the project is $2.44 per barrel and the operating cost is below $6/barrels. This yields a rate of return of 22% for an oil price of $25 per barrel. 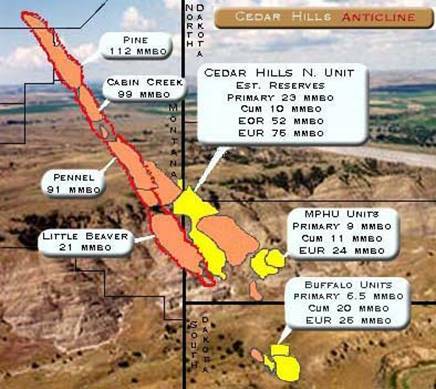 As a result of these successful projects the entire Cedar Creek Anticline was developed with high pressure air injection by 2009. Total additional oil production from the anticline due to air injection may reach 250 million barrels.